Sea Kale – Dig Delve – An online magazine about gardens, landscape, growing & making. Two years ago we made up the sloping ground between the house and the large agricultural barns to the west to provide a level space for our productive garden. Beyond the barns is an exposed area of crushed aggregate over mixed soil and builder’s rubble, where Dan has been trialling a variety of plants suited to these challenging conditions. One of the key plants is sea kale (Crambe maritima), which he has interplanted with a range of low growing plants which allow it access to the full sun it requires to thrive. These include Dianthus cruentus, Euphorbia ‘Copton Ash’ and Eryngium giganteum, the last an ornamental nod to the sea kale’s native coastal companion, sea holly. Here the sea kale is the first plant to stir after the winter, with a long season of interest. First in late March the deep purple shoots appear on the wizened stems. These unfurl into thick, blue-green ruffled leaves with the texture of fine suede, on which water droplets bead like mercury. By the end of May, clouds of tiny white honey-scented flowers appear, which attract a wide range of pollinating insects, including bees, hoverflies and moths. After pollination pea-sized pale green fruits appear, which remain on the plant until the first frosts. I first saw wild sea-kale growing in the shingle at Church Norton near Pagham Harbour. It grew prolifically in the shingle there and even with my nascent knowledge of plants, I could tell that it was a cabbage of sorts, and most likely edible. In fact all of its parts are edible, unless you live at Dungeness where, Howard Sooley, a friend and the photographer of Derek Jarman’s garden, has told us foraging is forbidden due to the high levels of radioactivity from the power station. The most usual parts to be eaten are the forced, blanched leaves. Forcing is the technique of excluding light and increasing warmth to the plant that allows us to steal a march on spring and eat some vegetables outside of their normal growing season. This can be done with a traditional terracotta forcer or an upturned black plastic bucket. The resulting growth is sweeter and softer due to the lack of chlorophyll production caused by blanching. Sea-kale became so popular a delicacy in Victorian kitchens that it was one of the first victims of over-zealous foraging, gathered in ever-increasing quantities from foreshores around the country to stock kitchen gardens, until it almost disappeared. Consequently, although it has been taken off the list of species protected by the Wildlife & Countryside Act (1981), it is one wild plant that you should grow yourself, leaving wild colonies to regenerate. We were lucky to find the remains of two terracotta sea kale forcers on the farm when we arrived here. 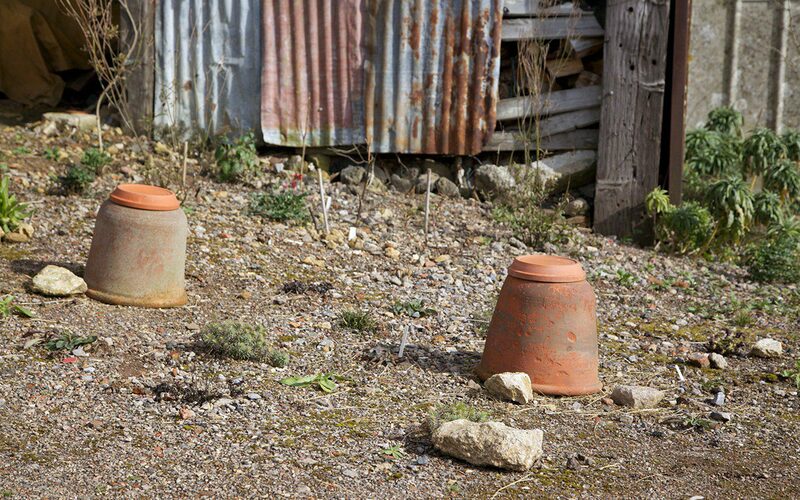 At first I mistook them for small rhubarb forcers, as they were stacked with a large number of broken larger forcers that had been used in the ramshackle rhubarb-forcing hut on the slope below the house. Dan quickly put me right, and it was this discovery that first piqued my interest in growing sea kale to eat. Although we grow a fair number of staples a large part of the pleasure of growing our own food is to have access to things that aren’t commonly available. 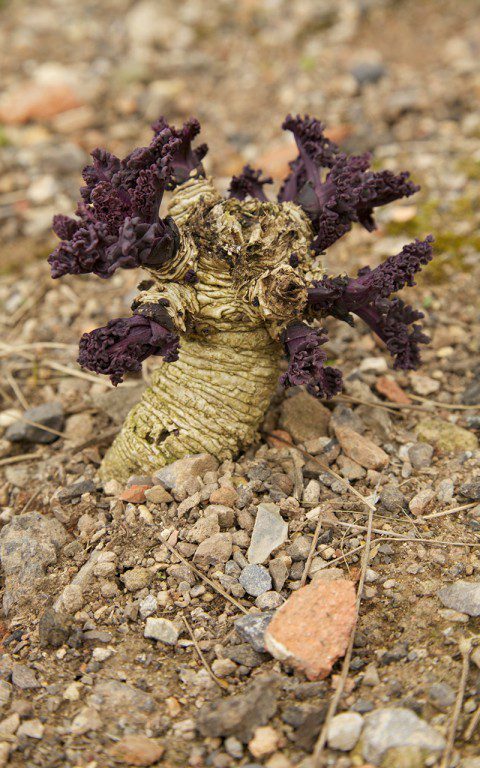 Since sea kale is easily damaged in transport it is a delicacy one very rarely sees for sale. Sea kale comes quickest from thongs, root cuttings taken from plants older than two years. It is tolerant of most growing conditions, but will not survive water-logging, and the optimum situation matches its native habitat – an exposed position with maximum sunlight, and a light, free draining soil with a steady dampness at the root. The books say that plants should be set 60cm apart, but we have found that 90cm is a more comfortable distance. Like rhubarb, sea kale overwinters through the reserves held in its thick, fleshy roots and the purple shoots naturally start to break their dormancy in late February. 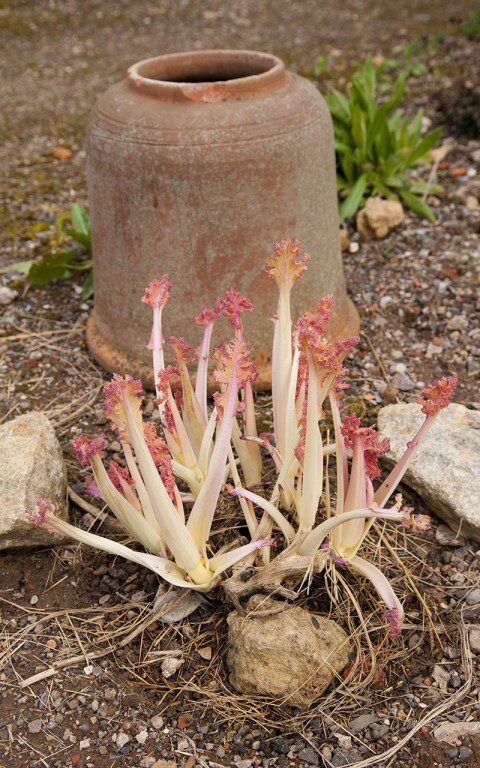 As with rhubarb crowns sea kale should not be harvested until the third year after planting to avoid weakening the plant. Any time from late December onwards is the time to start forcing, although we generally don’t get round to it until late January or early February when the craving for fresh produce stimulates our memory. It takes 4 to 6 weeks for the blanched shoots to be ready to harvest, when they have reached a length of around 20cms. To harvest you slide your forefinger and thumb down each side of the stem and snap it off at the base. Remove the forcers as soon as you have enough to eat to allow the plants to regenerate, leaving at least a third of the leaves on the plant and removing flower shoots as they appear to allow the plant to build up strength. In an ideal world grow enough plants to harvest one year on and one year off, until they are established. If they like you they will live for decades on little more than admiration.